Polyclonal antibody raised in rabbit against human DNMT3A, (DNA methyltransferase 3A), using a KLH-conjugated synthetic peptide corresponding to amino acids 107-121. 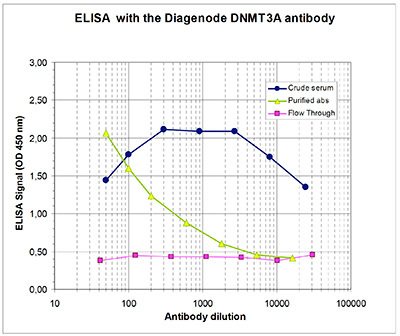 To determine the titer of the antibody, an ELISA was performed using a serial dilution of the Diagenode antibody directed against human DNMT3A (Cat. No. pAb-086-050), crude serum and Flow Through in antigen coated wells. By plotting the absorbance against the antibody dilution (Figure 1), the titer of the antibody was estimated to be 1:400. Human embryonic kidney cells (HEK293T) were transiently transfected with an expression vector for GAL4- tagged DNMT3A. Whole cell extracts were immunoprecipitated with 2 μg of antibody against DNMT3A (Cat. No. pAb-086-050). The presence of GAL4-DNMT3A in the non-treated cell extracts and in the immunoprecipitates was demonstrated by western blot analysis with anti-GAL4 antibody (lane 1 and 2 respectively). Alternatively, GAL4-DNMT3A was immunoprecipitated and western blot analysis was performed with the DNMT3A antibody (diluted 1:2,000) (lane 3). Diagenode strongly recommends using this:	DNMT3A polyclonal antibody - Classic (Diagenode Cat# C15410086 Lot# A70-001). Click here to copy to clipboard.